Aimovig. You may have heard the name or seen headache and migraine accounts talk about it on social media, but what exactly is it? Aimovig was the very first medication approved by the FDA solely for the treatment of chronic migraine. 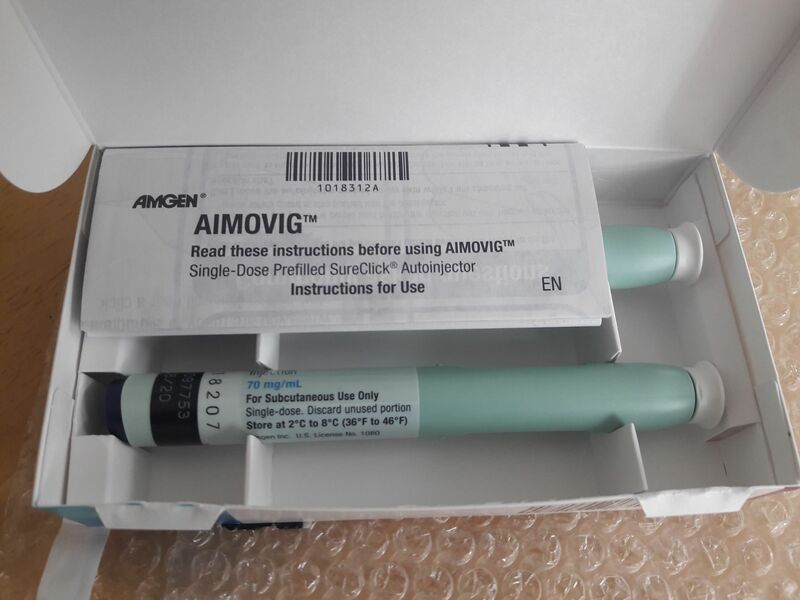 Aimovig is a once-a-month injection used to treat migraine prophylactically. 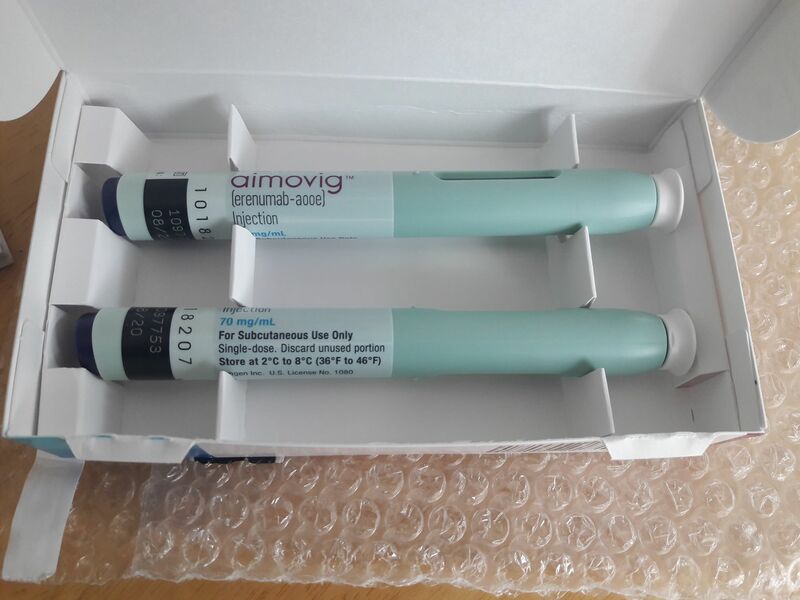 So how does Aimovig actually work? 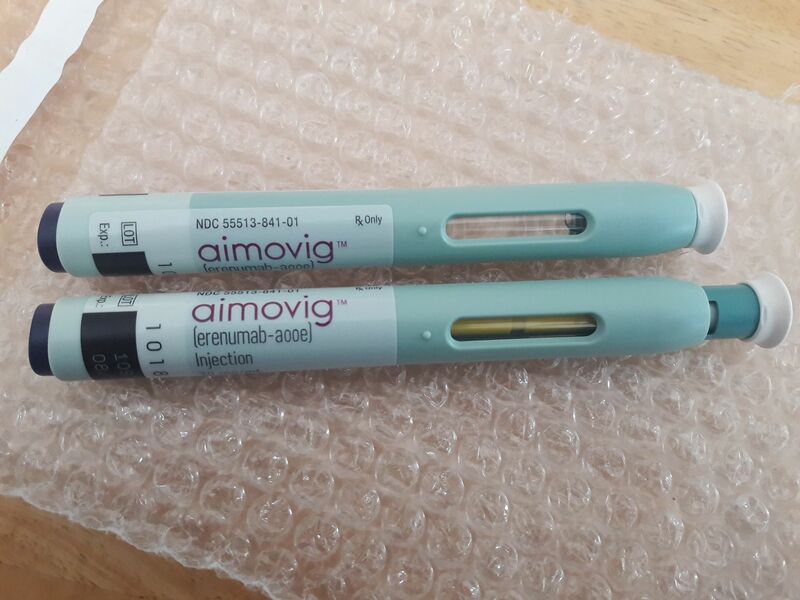 I did my very first Aimovig injection on July 13, 2018. The medication was prescribed to me by my neurologist. He thought I would be a good candidate for Aimovig since many of the other prophylactic migraine medications on the market caused horrible side effects for me. On that day I did one injection in my leg. My neurologist wanted me to try one 70mg injection at first but then do two injections for a total of 140mg if I didn’t think it was helping. I ultimately ended up at the 140mg dose. A little background information for you to know: I also do Botox injections every three months to treat my chronic migraine. However, Botox is not enough to keep migraine at bay which is why a second medication was suggested. I didn’t notice much improvement the first two months of injections. Around the third month though, I started having fewer headache days and the severity wasn’t as bad either. But then the fourth month came and I felt like it was ineffective; I was quite discouraged as I had experienced a great month prior. But then the next round of injections was great again, so I began to realize my experience with Aimovig was much like my experience with Botox: the effectiveness varies. Some months my headache days are minimal and I can function like a non-migraineur. But then other months I am bedridden for the majority of the month. I think others who use Aimovig will agree that each month truly varies. Some migraine triggers such as stress, environmental factors, food, etc. can’t always be controlled but that isn’t Aimovig’s fault. 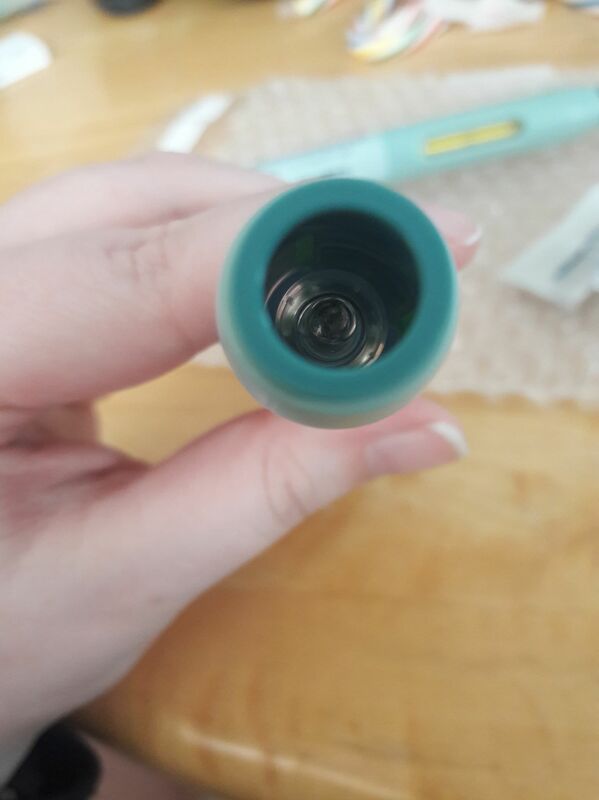 I am getting ready to do my 7th round of injections this month and though they hurt like heck (for me at least) I am grateful for the relief despite it being varying. If your doctor suggests Aimovig for you, I would say give it a try. The most common side effect is pain at the injection site and some hair loss. If you have been through the ringer of horrible migraine medications like I have, then you know that those two side effects aren’t that bad; it could be a lot worse (see Topamax, Verapamil and Amitriptyline as a few examples). 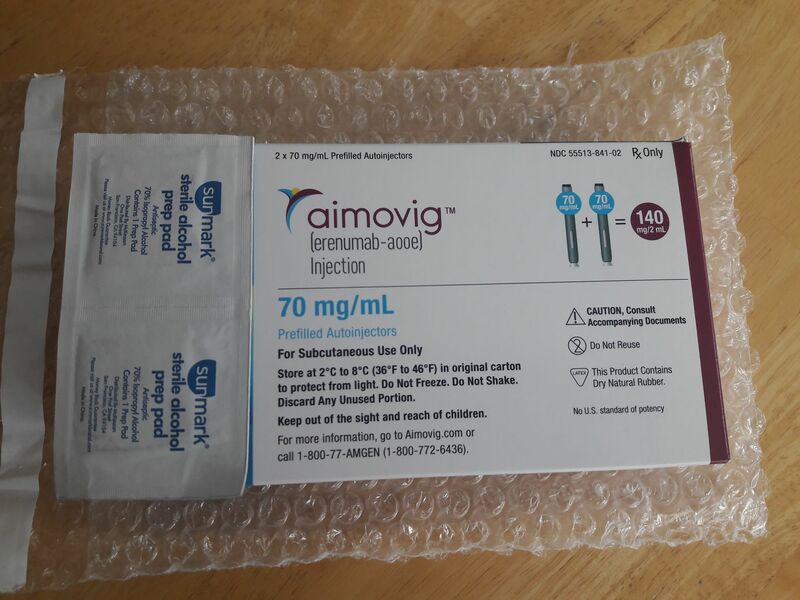 Adding Aimovig to my migraine treatment plan has given me pain free days I know I wouldn’t have had without it. Even though some months I feel like it doesn’t work or barely works, the days where I do have relief gives me hope. While I may not like stabbing myself with the injectors each month, the relief is worth it to me. Thanks for the observations re Aimovig. Your comments about varying levels of pain sensitivity made me wonder if you might have an issue with your glutamate metabolism causing hyperalgesia. If you do, a drug called Memantine may help significantly. Unfortunately there are no tests yet. Something to possibly discuss with your neurologist. And yes, I have first-hand experience. Good luck. Thanks to my Neurologist, whom was patient, very patient and caring until we got just the right plan !!!! Do you know how expensive it is or if insurance usually pays for it? I have chronic daily migraine. I used to get imitrex shots, but now my insurance wont pay for it.